In September 2015, the UN General Assembly adopted the 2030 Agenda for Sustainable Development containing 17 Sustainable Development Goals (SDGs) the world’s states are committed to achieve until 2030. Already in 1987 the Brundtland report stated: „Sustainable development is development that meets the needs of the present without compromising the ability of future generations to meet their own needs.“ In the years to come, the discussion about the term sustainability lead to the definition of three main pillars of sustainability. Adopting the 2030 Agenda, all states committed themselves to align their policies with the objectives for a sustainable development. In contrast to the Millenium Development Goals, the 2030 agenda applies for all states not only for low- and middle-income countries in the Global South. Thus, Germany is a developing country. The 2030 agenda lists 17 Sustainable Development Goals (SDGs) including 169 targets. The quantity of goals and targets indictes the complexity behind the agenda which is the result of years of discussion all over the world. 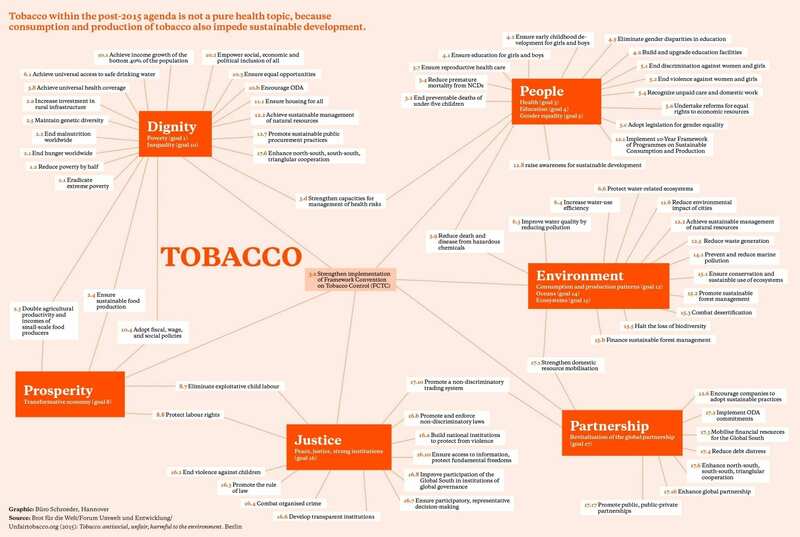 Tobacco is a good example to show the interlinkages between the different goals. 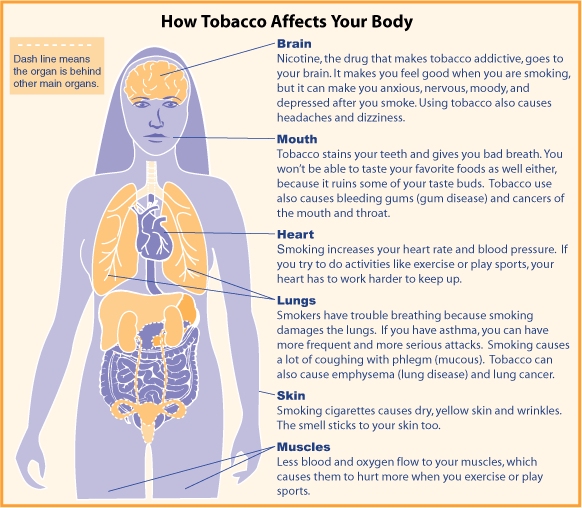 Tobacco use is the single most preventable risk factor for non communicable diseases (NCDs) like cardiovascular diseases, lung diseases, cancer and diabetes. Worldwide 7 million people die due to tobacco use every year. The most important instrument of implementation for goal 3 is the World Health Organization’s Framework Convention on Tobacco Control (WHO FCTC). Tobacco use is costly. Expenses on tobacco hit particularly the poorer parts of the population, in high-income countries as well as in countries of the Global South. In 2015, poor households in Indonesia used about 7,5% of their household expenses for cigarettes, just as much as for housing. In contrast, they only spent 1,8% of their expenses on education. 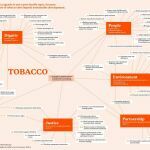 More than 17 million people around the world are working in tobacco growing – primarily in low- and middle-income countries. Many smallholder farmers have difficulties in making a living from tobacco growing. Furthermore, tobacco growing directly competes with food farming in many countries. In six of the top ten tobacco growing countries a significant share of the population is undernourished. More than ten million people could be fed, if food crops were grown instead of tobacco in these countries. Revitalising the global partnership is a comprehensive goal and in case of tobacco it contains some pitfalls. SDG 17: International cooperation between governments, civil society and the private economy for the provision of fi nancial resources, for knowledge sharing and for systemic changes. The undifferentiated pursuit of targets like the increase of exports (17.11) or the expansion of duty-free markets (17.12) would be counterproductive regarding tobacco, because tobacco kills half of its consumers when used as intended. 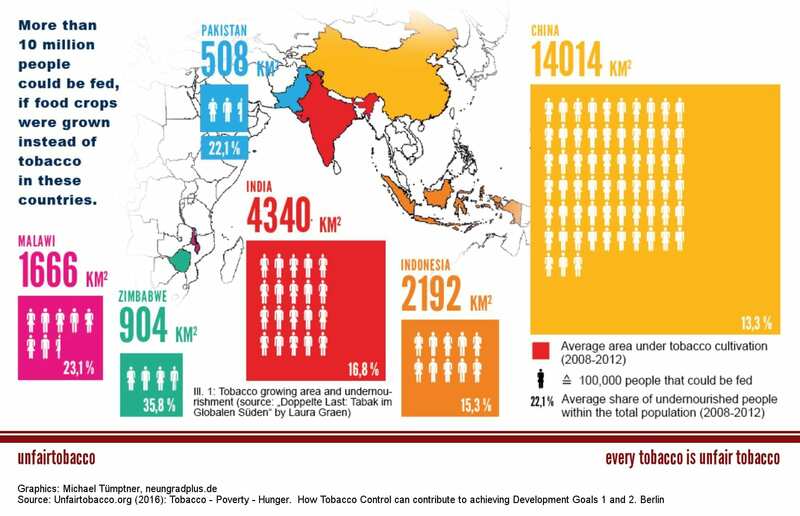 But the goal’s core – revitalising the global partnership – is of highest importance for tobacco control. Since the adoption of the WHO FCTC, ten years of practised global partnership, particularly the international exchange of knowledge, experiences and technologies, have effected great progress towards reducing tobacco use. 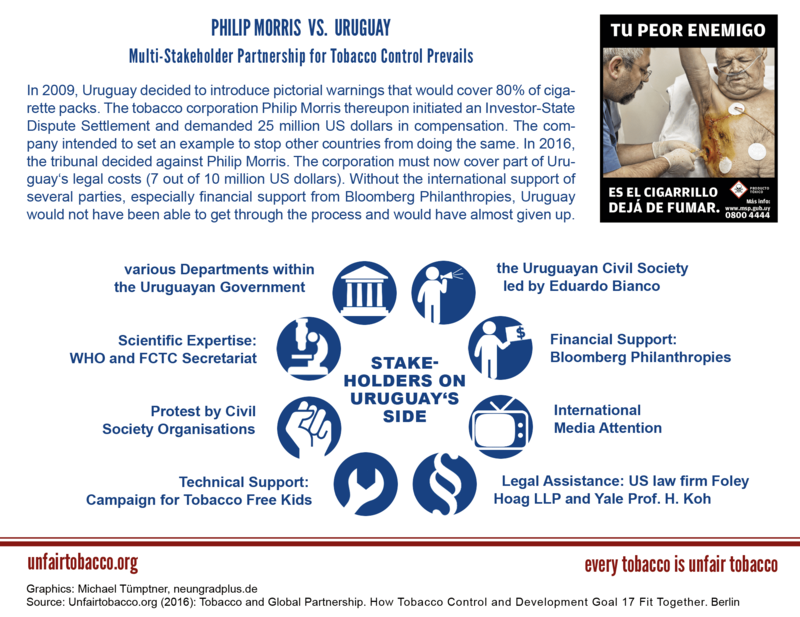 A particularly successful global partnership for tobacco control was active during the investor-state-dispute between Uruguay and Philip Morris International. Worldwide, the proportion of smokers is highest in parts of the population with low socio-economic status. 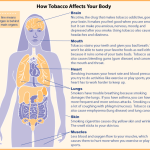 That means, education is one of the factors influencing smoking behaviour. This applies to low- and middle-income as well as for high-income countries. Money spent on tobacco products is not available to pay for other needs. This is especially evident in low- and middle-income countries and reveals an intergenerational conflict: the addiction of the parents adversely affects the future opportunities of their children. In tobacco growing countries children often work on tobacco fields, because smallholder farming families are economically dependent on multinational corporations. 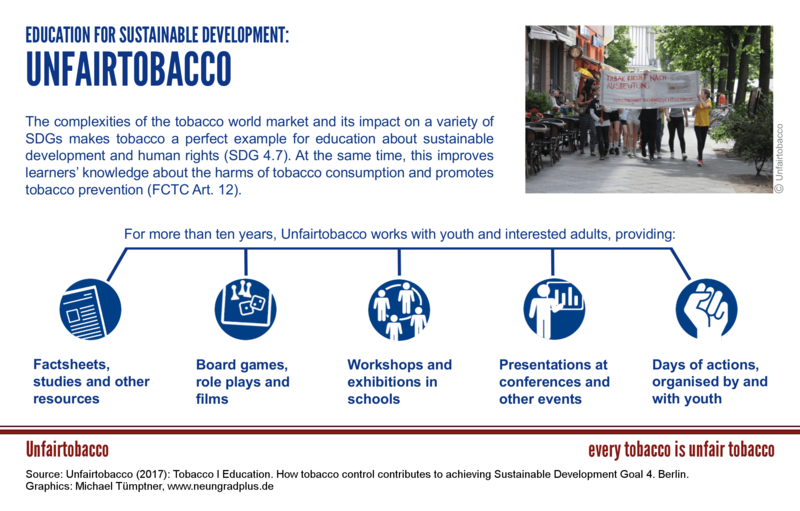 For children, tobacco growing is especially dangerous and impacts strongly on the children’s rights to education and leisure. At the same time, good education is needed to break the cycle of poverty and the dependence of farming families on tobacco companies. The tobacco world market is complex and involves many players. The impact of tobacco cultivation and the use of tobacco products is diverse. For tobacco, fair trade is not an option due to its devastating impact on people’s health. 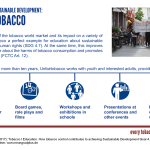 Thus we use tobacco as an example in our education programme on sustainable development and simultaneously promote tobacco and smoking prevention. The health consequences of secondhand smoke cause the death of 886,000 people every year. Nearly half of them, i.e. 433,000 people die because they were exposed to secondhand smoke at work. This number equals about 20% of all deaths worldwide caused by occupational diseases and injuries. Therefore, smokefree workplaces are an important contribution of tobacco control to achieve SDG 3.4 (30% reduction in premature deaths due to NCDs) and 8.8 (decent working conditions for all). Worldwide, more than 17 million people are working in tobacco cultivation, primarily in low- and middle-income countries where labour standards are often low. 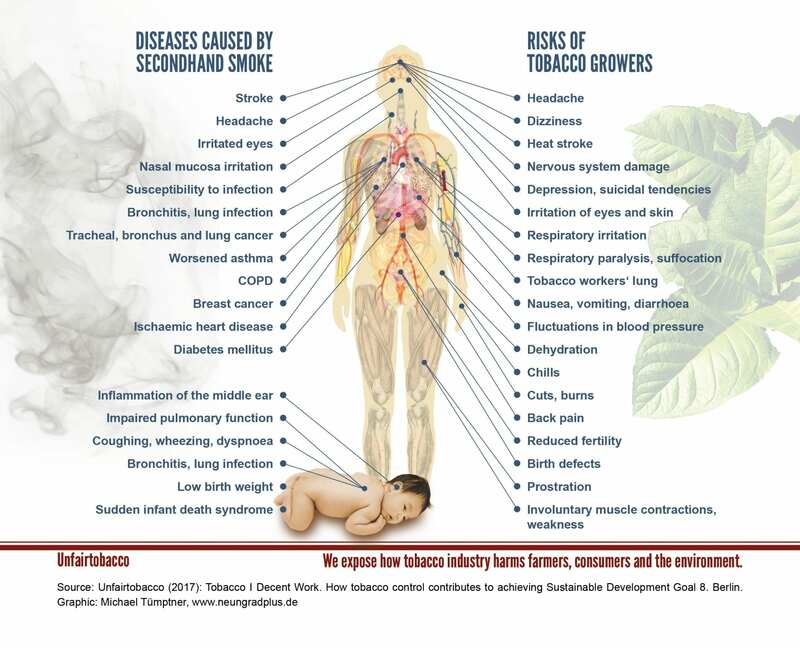 Tobacco growing is shaped by intensive use of chemicals. Therefore, occupational injuries like poisonings are prevalent. 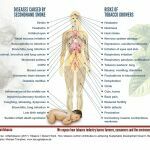 Additionally, the tobacco plant contains the neurotoxin nicotine causing an acute nicotine poisoning, known as Green Tobacco Sickness. In this context the widespread child labour on tobacco field is particularly alarming. This year, we will continue to explore and explain the links between SDG 3 (health) and the SDGs 14 (protection of oceans) and 15 (protection of forests). We will present our expertise and knowledge on this page. These short case studies take a closer look at alternatives to tobacco growing. Are they economically viable? Are they ecologically justifiable? Do they contribute to more social justice?